The sun in Seville is deceiving in the month of October. The crisp Autumn days I remember from growing up in the Midwest mean nothing here, as the blustery weather is an afterthought and never really arrives to Seville until Winter begins in late November. While mornings can be cool, the midday sun blazes like it would on a summer beach day. My friend Jacqui and I have a lot in common, choosing Spain after we graduated from Midwestern universities. We like being outdoors and having a beer midday. We like beaches. I begged her to send me this picture from Almería, a small corner of Andalcuía I’ve never been to. 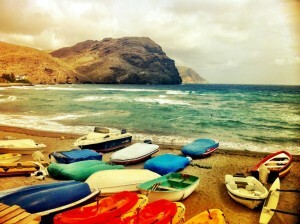 This photo was taken at the beach in Las Negras, Almería. It is a quaint, charming and peaceful town of less than 400 residents right in the middle of Almería’s Natural Park Cabo de Gata. The town got its name from the founders, a group of widows from a nearby community who had los their sailor husbands in a mysterious shipwreck. It’s a great place to stay on a trip to Almería due to its proximity to several of the region’s best beaches and natural park. Jacqui Davis has been living in Spain for nearly six years now, where she is a program Director for a study abroad company. She LOVES travel and languages, running, outdoor activities and her boyfriend and especially trips that include all of the above. Gorgeous picture. I guess I formed an erroneous image in my mind of Almeria. I used to work in a small, Spanish telecoms company, which caters mostly to British ex-pats, and there were so many in Almeria that it put me off wanting to go there! Wouldn’t you think I would know better – living on Tenerife!!!!! Absolutely putting it on my “to see in Spain” list now! !…..perhaps off season though! Agreed! Maybe it’s just because Almería is a pain to get to from here, or because I haven’t heard overly positive things about it yet, but if I spent a weekend in Mrucia, there should be no excuse! !